Chlorophyll is the cellular organelle that allows for organisms to produce their own food through photosynthesis. All plants and several different types of microorganisms go through photosynthesis. Algae is a broad term that includes several different types of photosynthetic microorganisms, and there are several different types of chlorophyll present in algae. Chlorophyll a is found in all organisms that photosynthesize, including algae. The reason that chlorophyll a is essential is because it is able to capture light wavelengths that fall in the spectrum of sunlight. Once captured by chlorophyll a (which is located in an organelle called chloroplast), sunlight combines with water and carbon dioxide to produce energy and glucose molecules used to power the algae cell's function. Chlorophyll a is a green pigment, which is what gives plants and many algae their natural green color. Chlorophyll b is a green chlorophyll pigment found in plants and green algae. Chlorophyll b augments chlorophyll a's ability to capture sunlight. Green algae is a broad, informal classification of organisms that includes both Kingdom Monera (single-celled organisms that do not have a nucleus) and Kingdom Protista (more complex single-celled organisms that do have a nucleus). Green algae are the most common organism found in fresh water and the ocean, and they are a major supplier of oxygen, which is produced during photosynthesis. Chlorophyll c occurs in certain types of algae, including dinoflagellates. Similar to chlorophyll b, chlorophyll c helps chlorophyll a collect sunlight, but it does not participate in photosynthesis beyond the initial stage. Chlorophyll c is a reddish-brown pigment and gives dinoflagellates their distinctive color. Indeed, dinoflagellates have been known to conglomerate in massive numbers (known as a "bloom") and turn an entire body of water red; this is where the Red Sea is believed to have gotten its name from. There are other pigments found in algae that are similar to chlorophyll, though they do not directly capture sunlight. One example is carotenoid, which is a brown pigment (and is found in brown algae which, similar to dinoflagellates, can cause an algal bloom). Additionally, some types of algae have chlorophyllin and phycobilins, which are water-soluble salt derived from chlorophyll used to help capture sunlight (though photosynthesis does not occur in either one), and which are also found in the chloroplast. Lichtenstein, Drew. "Types of Chlorophyll Present in Algae." Sciencing, https://sciencing.com/types-chlorophyll-present-algae-8433014.html. 24 April 2017. 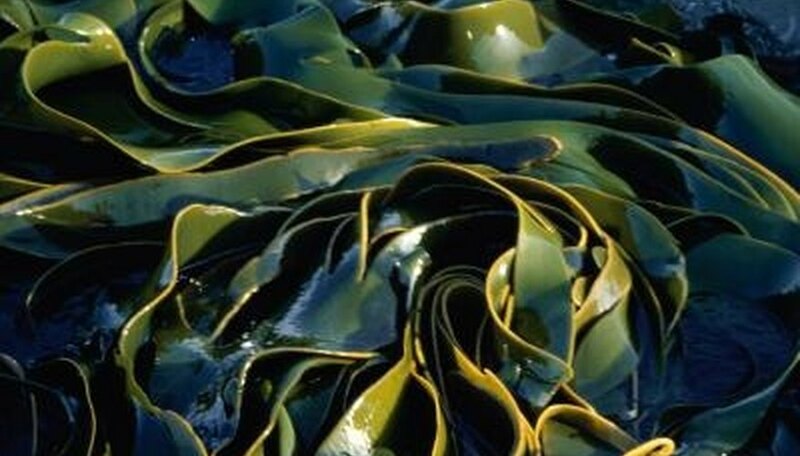 How Does Seaweed Conduct Photosynthesis? What Causes the Bioluminescent Bay?